Knesset Speaker Yuli Edelstein (Likud) spoke Wednesday at the European Parliament in Brussels at an event marking International Holocaust Remembrance Day, claiming that European countries had not yet fully internalized the lessons of the genocide which took place more than seven decades ago. During his speech, Edelstein condemned European Parliament members who joined a delegation which visited Tehran. "I am aware that a delegation from this parliament recently visited Tehran," Edelstein said. "I do not know who participated in the trip, what plans were made or what meetings were held, but I do know that no one mentioned Holocaust denial, which has become a regular occurrence for the Iranian regime! I am sure that no one protested the cartoon contest that ridiculed the Holocaust through the use of the oldest and worst anti-Semitic stereotypes." 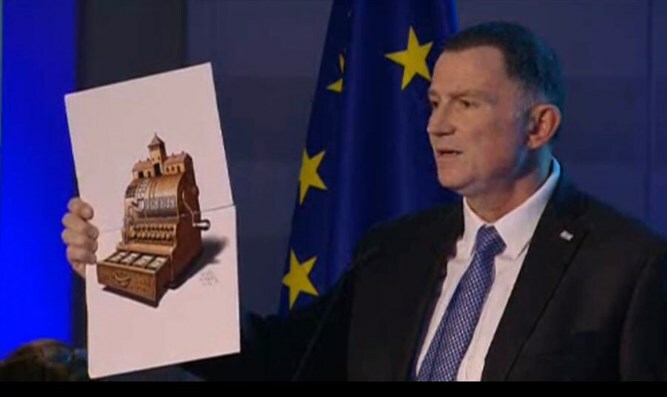 Edelstein then presented an anti-Semitic caricature to the parliament which won first place in the Tehran cartoon competition and claims that the Jewish people is using the Holocaust for financial gain at the expense of the world. "For 'never again' to really mean never again, consistent and sincere actions are necessary. Anti-Semitism, wherever it rears its ugly head, for whatever reason, is wrong and must be fought at every turn. Writing off such acts as ‘mere opposition to Israel’ is absurd. Anti-Semitism has no excuse - not religion, not poverty, not lack of education, not political disagreements. Today we know that we ignore hatred and intolerance, at our peril." “When leaders embrace the local rabbi in solidarity after a hate crime and treat Hamas as a legitimate voice? When an attack is condemned as anti-Semitic and then Israel is denounced for fabricated war crimes? "I stand here today mindful of the warning issued by Simone Veil, a survivor from Auschwitz who later served as this institution's [the EU's] president: 'Never Again,' she once said, 'is never enough to protect future generations. It takes more than words, more than resolutions, more than good intentions.'"